In this lesson, we will learn how to calculate the sum of a given arithmetic series or a specific number of terms in it. Find the number of terms in the arithmetic sequence whose first term is 11 and last term is 81, where the sum of all the terms is 506. Find the number of terms for which the sum of the sequence ( 1 6 0 , 1 4 4 , 1 2 8 , ) is 0. The house numbers on one side of a street are 1 , 2 , 3 , 4 , … , 4 9 . Find the house number where the sum of the numbers before it is equal to the sum of the numbers after it. Find, in terms of 𝑛 , the sum of the arithmetic sequence ( 9 , 1 0 , 1 1 , … , 𝑛 + 8 ) . 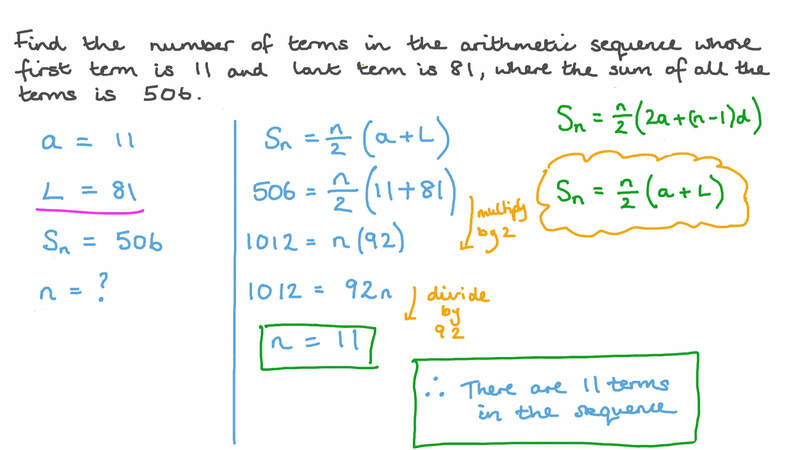 Find the sum of the 6 consecutive terms that start from the eighteenth term of the arithmetic series 1 6 + 2 3 + 3 0 + ⋯ . Find the least number of terms needed to make the sum of the arithmetic sequence ( 1 5 , 1 0 , 5 , … ) negative. Find the sum of the sequence of odd natural numbers which are greater than 46 and less than 92. Find the 12-term arithmetic sequence given the sum of the first 4 terms is − 1 5 8 and the sum of the last 4 terms is − 5 7 4 . Find the arithmetic sequence given the sum starting from the second term is 567, the sum excluding the last term is 469 and the difference between the tenth and sixth terms is 28. Find the arithmetic sequence that starts at 𝑇 1 given that the sum of the first 17 terms is 748 and the arithmetic mean between 𝑇 4 and 𝑇 1 2 is 48. Find all possible arithmetic sequences that satisfy 𝑆 = 0 2 3 and 𝑇 × 𝑇 = − 2 1 6 6 1 3 where 𝑆 𝑛 is the sum of the first 𝑛 terms of the arithmetic sequence, 𝑇 𝑛 is the 𝑛 t h term, and 𝑇 1 is the first term. In an arithmetic sequence that starts at 𝑇 1 , 𝑇 = 2 9 2 7 and the sum of the eighth and the twelfth terms exceeds the fifteenth by 7. 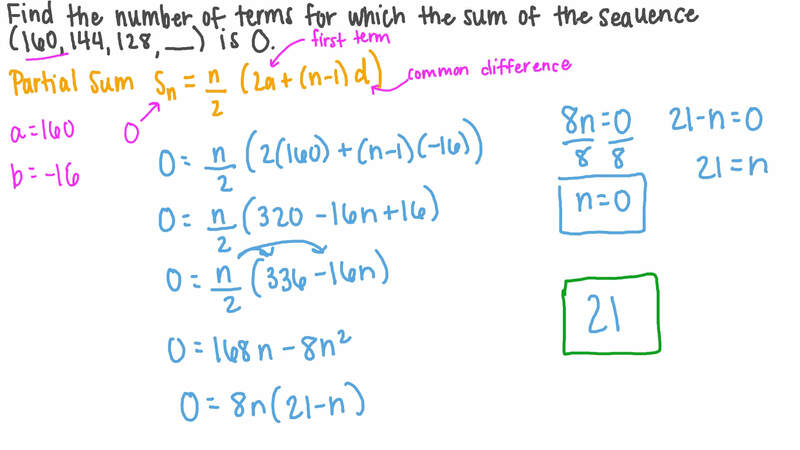 Find the number of terms whose sum is 322. Find the sum of a sequence which has 21 terms, given that the sum of the first third of the terms is 21 and that of the last third of the terms is − 1 1 5 5 . Then, find the sum of the middle five terms. 14 pegs are placed on a washing line at 7 meters apart with a basket beside the first peg. Find the total distance covered if a person collects the pegs one by one, without moving the basket and returning to the basket after collecting each peg. A theatre has 40 rows of seats where the first row has 27 seats and each subsequent row has 3 more seats than the one previous. Find the total number of seats in the theatre. A runner is practicing for a long-distance race. He covers 6 km on the first day and then plans to increase his distance by 0.7 km every day. In how many days will the runner cover a distance of 67.6 km given he follows the plan? An employee’s annual salary in his first year was 6 500 LE. Every year his salary exceeded that of the year before by 240 LE. Find after how many years his annual salary would be 8 420 LE, and then find out the total salary he received during this period. The 𝑛 t h term of an arithmetic sequence is 𝑎  and the first term is 𝑎  . Find the sum of the positive terms of the arithmetic sequence in which 𝑎 = − 5 4   and 𝑎 = − 8 4   . Find all possible values of 𝑛 for which the sum of the sequence 6 4 , 5 6 , 4 8 , … is 264. The 𝑛 t h term of an arithmetic sequence is 𝑇 𝑛 and the first term is 𝑇 1 . Find the sum of all the terms from 𝑇 7 to 𝑇 1 8 for the arithmetic sequence that starts 1 0 + 1 9 + 2 8 + ⋯ . A man bought a car for 77‎ ‎500 LE. He decided to pay for the car in 20 years in monthly instalments given by an arithmetic sequence. After paying the 9th instalment, the man passed away owing the car dealer 2 2 3 1 of the total debt. Find the value of the first instalment. You open a book to the middle and see page numbers 12 and 13. What is the sum of all the page numbers in the book? Find 𝑛 given that the sum of the first 𝑛 terms of the arithmetic sequence ( − 1 8 , − 2 1 , − 2 4 , … ) is 21 times greater than the sum of the first 𝑛 terms of the arithmetic sequence ( − 6 9 , − 5 4 , − 3 9 , … ) . Find 𝑇 1 3 given that the sum of the first 𝑛 terms of the arithmetic sequence is 𝑆 = 𝑛 2 ( − 9 𝑛 + 1 0 5 ) 𝑛 .